Gear & Advice You Can Trust. 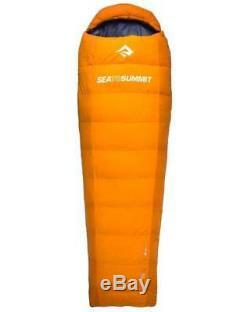 Sea To Summit Trek 3 TKIII Down Sleeping Bag - Long. The team at Sea to Summit have been hard at work to make a great bag... The new Trek Range Redefines the industry standard for the classic tapered rectangular sleeping bag The Trek 3 is the warmest Trek sleeping bag, an excellent companion for those long cold nights camping out on the trail. Incorporating Sea to Summits 2D PermaShell fabric and a premium 650 loft down, the Trek bags are a refined classic. The 60/40 fill ratio in the Trek bags is maintained using a side block baffle and differential cut shell. In the top of the shell a 3D side wall, a feature normally reserved for technical alpine sleeping bags, provides more space for the down to loft right to the edge of the bag. An oversized security pocket located inside the bag is easily accessible, ideal for stashing passports and other valuables while travelling. The soft touch lining fabric is down proof by construction and highly breathable offering a comfortable sleep. The Trek series is our choice for adventure travel and globe-trotting. Whether sleeping in hostels throughout Europe, backpacking South America or discovering the Stirling Ranges in Western Australia. The tapered rectangular design offers a good compromise between the comfort of a generous cut shape and warmth of a closer fit. A full length side and foot zip allow the Trek series to be opened out into a full duvet for use indoors and warm weather. Sometimes a mummy bag doesn t fit the bill - a bit too snug, a bit too constricting. For those who like the extra space and versatility of the classic tapered rectangular shaped sleeping bag, we have created our Trek series but given it our top-of-the range pedigree. Compression bag and packed size:Small 28 x 17cm. 2D PermaShell fabric used in our Trek series bags is a high-density weave, 33 denier Nylon with a DWR finish. This material is highly vapour permeable and down proof by construction therefore it does not rely on coatiings. Fabrics Lining 650 Loft Series. The lining material is a high-density weave, 40 denier nylon. This fabric is engineered for comfort using a high filament count to achieve a soft surface and silky hand feel. The natural position your feet will take when lying flat is relaxed at ease and slightly stretched out. The anatomical cut box foot tapers in three directions. There is vertical taper from the toe to the heal creating a slant that matches the relaxed form of your feet. Along the outer edge of your foot there is a trapezoidal taper that provides a form fit, keeping down close to your extremities so they don t get frostbite. From the top view, there is an outward taper from the ankles to the feet. This creates room for your toes to have great circulation and traps warmth in the foot box. This design exists in both the Alpine and Traverse bags. All Sea to Summit sleeping bags use YKK zips. The Alpine, Traverse and Trek series use YKK #5 reverse zips, this allows you to un-zip the sleeping bag from top and bottom for temperature regulation. Alpine, Traverse and Trek bags are fitted with a fixed zip length for all sizes. These bags can be zippered together in any combination of model and size. The Micro series use a lightweight YKK #3 zip. Micro s can be zipped together with other Micro s. Neatly hidden in the draft tube is a super high-density 210D poly cloth. This fabric is exceptionally stiff and was originally engineered for use in high performance race sails. The lightweight, durable, stiff finish provides an excellent zipper anti-snag. The Alpine and Traverse series use 3D compound differential cut patterning, this forms a shape that naturally traps warmth were it is most essential. The Micro and Trek series use a 2-Dimensional cut. These hoods easily pull into a form fitted profile using the dual-adjustment drawcord. Around the perimeter of the hood an internally constructed drawcord tunnel ensures the cord is buried deep within the down. When drawn closed the hood forms a comfortable seal around your face. A low profile Nifco dual cord adjuster is used for comfort and durability, offering a versatile fit. The hood closure uses a non-stretch cord for refined adjustment, while the neck collar uses an elastic cord to stretch with you as you move in the bag. A large Security pocket is located inside the chest area, it can fit a passport and wallet or be used to stow your electronic devices. Anti-snag coupled with a YKK Invisible Zip ensures an ultra low profile for comfort against the skin. Differential Cut Shell & Lining. Down insulates best when it is uncompressed and fully lofted. To help the down loft correctly, we use a differential cut shell and lining. 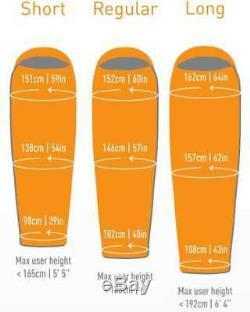 The top shell of all Sea to Summit sleeping bags is cut larger than the lining. This creates space in between for the down to loft fully. In addition we use 3D side walls which gives the distinctive vertical sides to our sleeping bags, this further aids vertical loft along both sides of the bag. In the bottom of the bag, we use a reverse differential cut. By increasing the size of the lining relative to the shell, down lofts up to fill the voids around your body, torso, legs and the small of your back. Trapping heat close to the skin is essential for efficient warm sleeping. Offset baffle construction provides a stable structure that allows the down to loft to the correct density and minimizes loss of heat through seams. This improves thermal efficiency of the sleeping bag without adding unnecessary weight of complicated baffle construction. Side Block Baffle & Fill Ratio. The loft is optimised using a side block baffle construction which allows the bags to be filled with a different ratio of down in the top and bottom. We have put more down in the top of the bag where it is most effective as the down isn t compressed by your body weight. 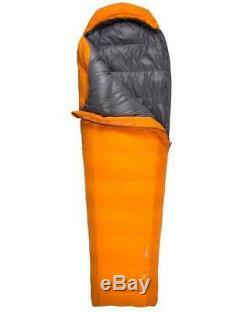 The exact ratio of down fill must be matched to the shape of a sleeping bag. The Micro bags slim fit forms a tight cocoon around the body, when you toss and turn at night, the bag rotates with you. For this style of bag it is best to use a 55/45 (top/bottom) fill ratio. In the Trek, Traverse and Alpine bags a 60/40 fill ratio is more suitable. These bags are a generous cut and have room inside to rotate without the bag following. In a world of technical brilliance it is remarkable that the performance of certain natural products have not been surpassed. Despite advancements in modern fibre technology, down is still the best insulator warmth for weight. Down forms the lightweight undercoating of birds, insulating them in very cold environments. The down we use is a by-product of the duck and goose meat industry. Like most natural products, down quality depends on many variables; predominantly the species, the feather content and the age. The best quality down is sourced from older birds, consisting of large plumes and clusters that create hundreds of thousands of tiny pockets, trapping body heat to provide unmatched insulation. Not only does down have the best warmth to weight ratio, it is also the most durable sleeping bag insulation. If kept dry and occasionally washed using the recommended method, it will last a lifetime. Loft is a measure of volume for a given weight of down. It is used to describe the quality of down, relating directly to the insulating performance. High loft down is warmer for a given weight than low loft down. Higher lofting down will fill a larger volume of space for a given weight, as a result, less down weight is required to fill each baffle in a sleeping bag. This translates to a lighter sleeping bag. The most common measure of loft is called Fill Power. 650 Fill Power implies that one ounce of this down will loft to fill a volume of 650 cubic inches. 850 Fill Power implies that one ounce of this down will loft to fill a volume of 850 cubic inches. 850+ Fill Power (Loft) Goose Down is the very best quality down available for sleeping bags. It provides the highest insulation for its weight and will last the longest. Sea to Summit 850+ Loft series bags are all filled with Eastern European Mother Goose 850+ loft down. We extensively test every batch of down to ensure the quality is consistently above 850 Loft. Eastern European Goose Down is well renowned for its high quality, achieving the best loft, with the largest clusters that are strong and resilient, lasting for years. We guarantee these bags are filled with goose down that exceeds 850 Fill Power in accordance to the International Down Feather Bureau (IDFB) standard. In the Sea to Summit Trek series, our 650 Fill Power duck down is a high quality insulation that sets the benchmark for sleeping bags in its class. All of our 650 Fill Power down is tested in accordance to the IDFB standard. Everyone sleeps differently; some people are very warm sleepers while others feel the cold easily. There are many factors that affect your warmth and comfort in a sleeping bag. An important factor is that you use a good insulating mat, so your body heat isn t drawn into the cold ground you are sleeping on. Other factors include your tent or shelter, gender and metabolism, clothing, sleeping bag liner, use of the hood and your daily calorie intake. Although the EN13537 standard does not identify a single precise temperature a tested sleeping bag is suitable for, it does provide an industry standardised temperature range that a typical user can refer to as a guide for the conditions their bag will be most comfortable in. The EN13537 standard provides three temperature levels to guide a consumer in their choice Comfort- the temperature at which a standard woman can expect to sleep comfortably in a relaxed position. Lower Limit- the temperature at which a standard man can sleep for eight hours in a curled position without waking. Tapered rectangular, 2D PermaShell DWR shell fabric, differential cut shell with 3D side walls, 60/40 fill ratio, side block baffle, zip draft tube with anti-snag, cushioned internal hood drawcord with dual adjustment, 2 way YKK #5 zips with separate foot zip, large sized internal zip pocket, includes lightweight Ultra-Sil compression bag, mesh storage cell and laundry bag. Down: 650 Loft 85/15 Premium Ultra dry Duck Down. Length / zip options: left. Suggested use: Trekking, Travel, Hiking, Camping. Compression bag: Small - 15L to 5L. Size: Long FROM 183 to 196cm height, chest circumference 152cm, hip 150cm and foot 101cm. There are plenty of discount operators out there, but all you get from them is a cheap price and nothing else. If it's just a price you're after these guys might be for you, but if you're after a service orientated company that won't sell any other way then welcome to our store. Our cheap postal prices are live up to date prices with Australian post or courier. Our website is state of the art safe and secure, using a 128 bit SSL encryption protocol, the most secure online-shopping protocol. Unfortunately we DO NOT accept EFT direct deposit. If your item is a double swag or over 20kg parcel must be sent via courier and a daytime street address is required - NOT A PO BOX. Express and regular options are available for most items. All item prices include GST. All payments made payable direct to'Wild Earth. While all care is taken, any errors or omissions/variations in the item details are unintentional. Colours and images are for illustrative purposes and can vary so please specify when ordering if you require a specific colour otherwise an alternative colour may be sent depending on stock availability. WILD EARTH AUSTRALIA PTY LTD reserves the right to make changes to this site and these terms and conditions at any time. From time to time we may contact you about offers and new products. You can easily be removed by unsubscribing. For full terms and conditions please visit here. We are here to help you! The item "Sea To Summit Trek 3 TKIII Down Sleeping Bag Long" is in sale since Tuesday, September 06, 2016. This item is in the category "Sporting Goods\Camping, Hiking\Outdoor Sleeping Gear\Sleeping Mats".